Ah, now comes the most wonderful part of this wonderful story. Tom, when he woke, for of course he woke—children always wake after they have slept exactly as long as is good for them—found himself swimming about in the stream, being about four inches, or—that I may be accurate—3.87902 inches long and having round the parotid region of his fauces a set of external gills (I hope you understand all the big words) just like those of a sucking eft, which he mistook for a lace frill, till he pulled at them, found he hurt himself, and made up his mind that they were part of himself, and best left alone. 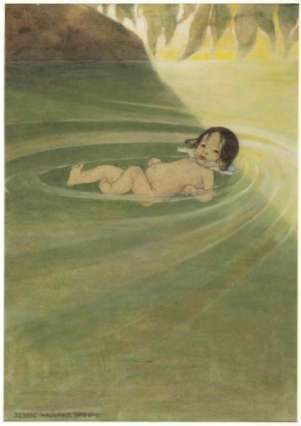 In fact, the fairies had turned him into a water-baby. A water-baby? You never heard of a water-baby. Perhaps not. That is the very reason why this story was written. There are a great many things in the world which you never heard of; and a great many more which nobody ever heard of; and a great many things, too, which nobody will ever hear of, at least until the coming of the Cocqcigrues, when man shall be the measure of all things. How do you know that? Have you been there to see? And if you had been there to see, and had seen none, that would not prove that there were none. If Mr. Garth does not find a fox in Eversley Wood—as folks sometimes fear he never will—that does not prove that there are no such things as foxes. And as is Eversley Wood to all the woods in England, so are the waters we know to all the waters in the world. And no one has a right to say that no water-babies exist, till they have seen no water-babies existing; which is quite a different thing, mind, from not seeing water-babies; and a thing which nobody ever did, or perhaps ever will do. Well. How do you know that somebody has not? Ah, my dear little man! that does not follow at all, as you will see before the end of the story.